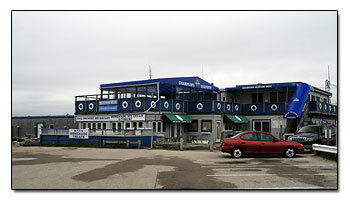 These pictures are of Champlin's Seafood Restaurant on the pier at Galilee RI. They sit right on the water's edge, and have a seafood deck for upstairs dining. 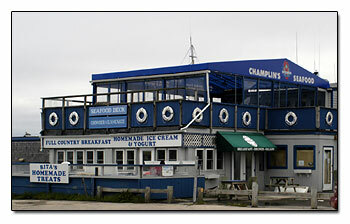 Champlin's Restaurant looks like a great place to eat. The whole restaurant dressed up in Nautical decor. Get their early in the morning and you can treat yourself to a full country breakfast before starting your day, and even watch the sun come up from their deck. Also Spain's of Narragansett is nearby. Georges of Galilee is another one that sits near the water. It's right across the street. Traveling I-95 in Rhode Island?